Adventist Church President in Jamaica Pastor Everett Brown challenged newly installed leaders in the North East Jamaica region to make the community and people their main object of the church’s mission. The challenge was made by the Adventist leader against the background of the recent spate of murders committed against women and children in the country. Pastor Brown said that in the pursuit of mission, leaders accept the responsibility to care for the sick, poor, the socially disadvantaged and the vulnerable in society. 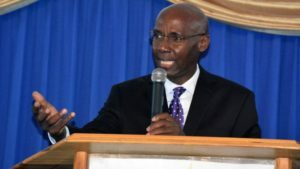 Although not making direct reference, Brown’s comments were coming on the heels of the suspected suicide of 59-year-old Adventist deacon Linton Stephenson of Mandeville, Manchester, who was being sought in connection with the recent murder of 25-year-old Khyhymn Campbell. “We must not give up on people who are in need of healing and salvation, we must not shrink back from engaging in mission activities because some of our leaders and members have failed God and the church,” said Brown. Stephenson, a church deacon at the Mandeville Seventh-day Adventist Church in Manchester was on parole following his release from prison for a previous murder conviction, according to police reports. He was also wanted for illegal possession of a firearm. A day before Stephenson was found dead last week, Pastor Brown condemned the alleged murder and appealed for individual to turn himself into the police. Pastor Brown said that the church’s finest moment is to go forward with courage in the might and strength of Almighty God. “Let us not allow our failures in the past or the unwarranted criticisms being levied at the church sidetrack us and cause us to lose our focus and dilute our message and thwart mission.” Brown added.